This cute congratulations card was created with the "Paisley & Posies and Designer Tin of cards stamp set. Card measurements 4 1/4" × 5 1/2"
To purchase these supplies shop my online store. Cut rich razzleberry cardstock 11" × 4 1/4", score@ 5 1/2"
Stamp whisper white cardstock with designs from Paisley and Posies stamp set to create your own designer series paper (DSP). Use both ink pads. Use sponge dauber and pool party ink to distress edge of white cardstock and stitched circle. 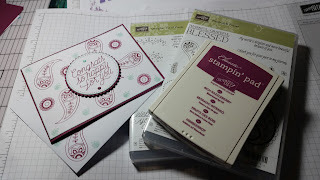 Stamp sentiment from Designer Tin of cards stamp set with rich razzleberry ink pad. Use fast fuse to attach custom made designer paper to card base. Attach stitched circle to scalloped circle. Use fast fuse to attach last piece of white cardstock to inside of card base. Use dimensionals to attached cirlces to center of card base. Then add one pool party and rich razzleberry enamel shape to circle layer. To make this project and more join my team. Stampin Up Designer Tin of Cards "Card Swap"
Cut Pumpkin pie cardstock 8 1/2" × 51/2", score @ 4 1/4"
Cut Pumpkin pie cardstock 3 1/4" × 2 1/2" & 3" × 2 1/4"
Cut Whisper white cardstock 4" × 5 1/4" & 2 7/8" × 2 1/8"
Cut Designer series paper (DSP) 3 1/8" × 2 3/8"
Stamp whisper white cardstock with design and sentiment from the Designer Tin of Cards stamp set using the pumpkin pie ink pad. Assemble and attach pieces using fast fuse and following the instructions from the video. To give card a little extra bling add an enamel shape.